I think that the gemstones in this stone are one of the most beautiful I've ever worked with. Their sweet, cornflower shade of blue is both eye catching and soothing and go perfectly with the pearls that make up this rosary bracelet. This rosary bracelet is made from genuine blue agate stone rounds and vintage pearl beads. The pearl and blue agate ave ("Ave Maria") beads count out a full decade, with a larger pearl pater ("Pater Noster") bead near the clasp. 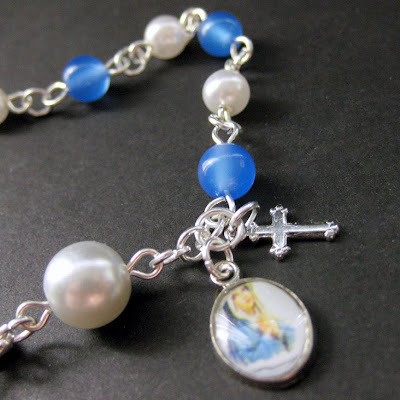 The bracelet is then finished off with a silver plated toggle clasp, a dangling holy cross and a framed full-color depiction of the Sacred Mother in miniature. This would be a wonderful gift piece for catholic weddings, communions, confirmation or just as a gift for someone special. I feel that in such an important pieces as religious jewelry as well as rosaries, being handmade holds special significance, creating a personal touch and attention to detail that commercial pieces lack. Every one of the links in this bracelet has been carefully turned by hand. This rosary bracelet measures 8.6" (22 cm) in length including clasp. Exciting news! This rosary bracelet has recently been published on the cover of the novel "De tweede verlosser" by Tomas Ross!